Editor’s note: This article was updated to reflect the announcement by the Department of Homeland Security that the H-2B visa cap would be increased and that premium processing would resume in select H-1B visa cases. The article was also updated to clarify that it focuses on the three key temporary worker visa programs that have received significant policymaker and public attention: the H-2A, H-2B, and H-1B programs. With laid-off workers by his side at campaign rallies, Donald Trump pledged to preserve “U.S. jobs for U.S. workers.” True to that promise, since assuming office, President Trump has issued an executive order and a series of policy statements, accompanied by executive-branch actions, intended to crack down on real and perceived abuses in temporary foreign worker programs. However, in a parallel reality, employers across occupations are increasingly relying on all available temporary worker channels to respond to labor shortages. Demand for H-2A, H-2B, and H-1B visas has grown as the U.S. unemployment rate fell to 4.3 percent in May, the lowest level recorded in 16 years. A month earlier, job openings were at their highest level since 2000, according to a recent Pew Research Center report. These three key temporary worker programs support a range of industries, from the seasonal agricultural and nonagricultural industries to high-skilled tech jobs. The most dramatic shift in usage of temporary worker programs has happened in the agricultural sector. The H-2A visa program, once reviled for its bureaucratic red tape, has seen a more than twelve-fold increase over two decades—from 11,000 visas issued in 1996 to more than 134,000 in 2016. As with the other temporary worker programs examined here, employers seeking to hire foreigners via the H-2A program must establish that doing so will not adversely affect wages and working conditions for comparable U.S. workers; employers applying for H-2A visas (as with the H-2B program) must certify that foreign temporary workers are necessary due to a lack of U.S. workers. Unlike the H-2B and H-1B programs, H-2A visas are uncapped, meaning U.S. Citizenship and Immigration Services (USCIS) may authorize an unlimited number in this category each year. Historically, however, employers have largely shunned the H-2A program, claiming it is burdensome, costly, and difficult to access. 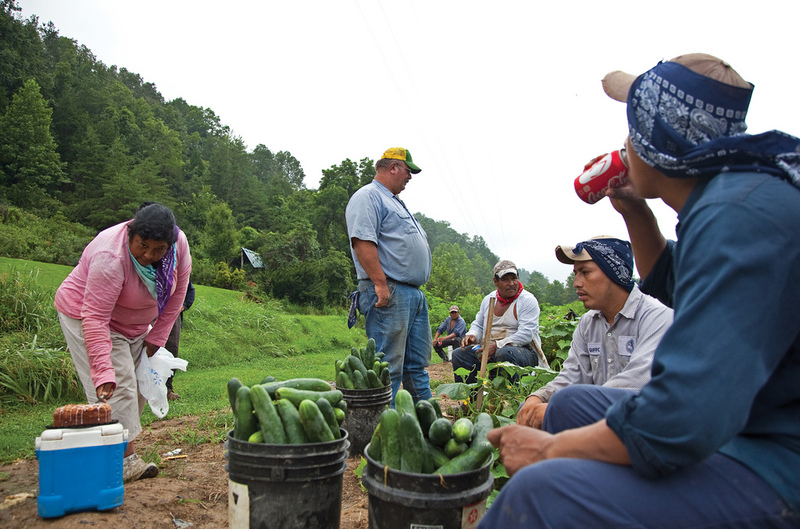 In 2013-14, according to the Department of Labor (DOL), while 47 percent of farm labor workers were unauthorized immigrants, just 1 percent of the work-authorized agricultural labor force was admitted through temporary worker programs. In 2014, apprehensions of Mexicans crossing the border illegally fell to the lowest level seen in more than 40 years. By 2015, the flows of unauthorized immigrants from Mexico to the United States reached a net negative, with more people returning to Mexico than coming to the United States. At the same time, the Mexican farmworker population has been aging out of the job and fewer young people are crossing the border from Mexico to work on U.S. farms. Source: Department of State, Bureau of Consular Affairs, “Report of the Visa Office,” 2000-2016, available online. This increasing reliance on H-2A workers seems to directly correlate with a tightening agricultural labor market and reduced willingness by U.S. workers to take on such physically demanding work. For example, a 2010 National Council of Agricultural Employers study found that more than two-thirds of the 36,000 U.S. workers referred to growers for employment by state agencies did not accept the jobs offered, and just 5 percent worked through their full contracts. It is estimated that the available supply of field and crop laborers in the United States dropped by 20 percent between 2002 and 2014, much of that attributed to a 75 percent decline in the number of new foreign-born agricultural workers arriving during the decade beginning in 2002. A slight increase in U.S.-born field and crop workers during that time period offset just 3 percent of this decline, according to a Partnership for a New American Economy study. Finally, a tighter labor market is beginning to boost wages in the agricultural sector, which is especially notorious for paying low wages. In California, crop production wages increased 13 percent between 2010 and 2015. Nationally, average wages for agricultural workers increased 5 percent throughout 2016, ultimately reaching $12 an hour, according to U.S. Department of Agriculture (USDA) figures. Since 2013, employers have also shown increased reliance on foreign workers admitted through the H-2B visa program, which is designed to fill temporary or seasonal jobs in nonagricultural sectors such as tourism, hospitality, or landscaping. The H-2B program is capped at 66,000 visas annually, split evenly between the first and last six months of the fiscal year. Congress in recent years has sidestepped the cap by exempting from the count returning workers who have been issued an H-2B visa during any of the prior three fiscal years. From 2013 to 2016, the number of H-2B visas issued increased 47 percent, from 58,000 to 85,000, and the program is already showing evidence of extraordinary growth in 2017. By the midway point of fiscal year (FY) 2017, employers had sought approval for 121,000 H-2B workers, 84 percent of the total requests the Labor Department received for all of FY 2016. The Wall Street Journal reported that in the first week of January 2017, when the application process for the second half of the fiscal year begins, the Labor Department received applications for 50,500 H-2B workers, almost double the number submitted during the same week in 2016. Evidence of labor shortages in the seasonal, nonagricultural occupations is coming from various sources. Nationally, although unemployment in the hospitality sector was at 6.3 percent in May, it has been trending downward since January 2010, when it stood at 14.2 percent. New England summer tourist areas such as Cape Cod and the Maine shore are experiencing labor shortages, the Boston Globe reported. While the national unemployment rate is 4.3 percent, it is 3.8 percent in Maine, which relies on H-2B visas for 10 percent of its 100,000 hospitality workers annually. According to the Denver Post, Colorado’s unemployment rate dropped to 2.3 percent in April, a low reached only four times by any state in recent history. Employers in the state’s ski industry are reportedly struggling to find temporary workers even as they have raised the average wage for seasonal workers to $14 an hour and have begun to subsidize workers’ housing. A Colorado Department of Labor and Employment economist estimated that there are about 60,000 unfilled jobs in the state. Despite vocal demands by employers and some members of Congress, the Trump administration has resisted raising the cap on H-2B visas. Congress implemented the exemption on returning workers in FY 2016, resulting in 85,000 visa issuances that year; lawmakers did not renew the exemption in the FY 2017 temporary spending bill. However, the FY 2017 Consolidated Appropriations Act, passed in May to fund the government through the end of this fiscal year, included a provision that authorizes the Department of Homeland Security (DHS) to more than double the H-2B cap, raising it by almost 70,000. The provision would essentially shift the responsibility—and potential blame—for increasing the admission of foreign workers in a contentious political season from Congress to the administration. Eighty-seven members of Congress from both parties and both chambers have signed a letter to the Labor and Homeland Security secretaries asking that they lift the cap. During a Senate Appropriations Committee hearing May 25, Homeland Security Secretary John Kelly indicated that he was likely to raise the cap. Facing some immediate political backlash, he retreated and in a subsequent hearing said that although he was studying the issue, he could not make a “hard case” for raising the cap. On June 21, a DHS spokesman said the cap would be raised, though a decision had yet to be made by how many visas. The H-1B program has received the most attention from the Trump administration, as the President and others have blamed it for the loss of U.S. jobs. The H-1B program allows employers to hire foreign temporary workers in specialty occupations that require at least a bachelor’s degree. H-1B visas are capped at 65,000 per year, with some exemptions, plus 20,000 for those who have earned a master’s degree or higher at a U.S. university. Like the other visa programs, demand for H-1B workers has been increasing in a tightening labor market. In 2016, 180,000 H-1B visas were issued, a 53 percent increase from 2010 and the largest number in more than two decades. Many of the program’s critics have argued that the increase in recent years can be attributed to heavy usage by outsourcing companies, particularly those based in India. The argument goes that these companies win thousands of visas for their employees by flooding the system with more visa applications than they expect to get approved. This strategy gives them an advantage for being selected in the lottery that USCIS conducts when it receives more applications than the number of visas available, a standard practice for the past five years. Critics also suggest that these companies tend to pay their H-1B workers less than U.S. tech companies pay their employees on the same visa. Recent evidence suggests that the outsourcing companies may no longer be as dominant a force in the H-1B visa process. The National Foundation for American Policy found that six out of the top seven India-based companies applied for fewer H-1B visas in FY 2016 than a year earlier. The seven together were granted 9,400 new visa petitions for initial employment, a 37 percent drop from 2015. According to Labor Department data on the ten companies that received the most H-1B certifications, Indian outsourcing companies accounted for 39 percent of the visas in FY 2016, down from 50 percent a year earlier and 60 percent in FY 2012. On the other hand, major U.S. technology companies such as Amazon, Microsoft, Google, and Apple all received more H-1B visas in FY 2016 than they did a year earlier, indicating an increasing reliance among U.S. high-tech employers. The relevant labor market data support this trend of increased need for foreign workers in this sector. The unemployment rate for computer and mathematical occupations in the United States was 1.9 percent in May 2017, compared to the national rate of 4.3 percent. These are precisely the occupations most commonly filled by H-1B workers: in FY 2015, 66.5 percent were employed in computer-related occupations. Further, the Bureau of Labor Statistics projected that employment of computer and information technology occupations will grow 12 percent from 2014 to 2024, faster than the average for all occupations. In April, Trump issued the “Buy American and Hire American” executive order, which instructs the secretaries of several federal agencies to propose new rules to protect the interests of U.S. workers and to suggest reforms to the H-1B program to ensure that the “most skilled or highest paid” applicants be admitted. Finally, both USCIS and the Labor Department have stated their intention to crack down on visa fraud, with Labor Secretary Alexander Acosta pledging increased use of criminal referrals. Despite popular belief that the crackdown on temporary worker visas is a Trump-era phenomenon, previous administrations have also tried to limit their usage or promote stronger regulations. The Obama administration, for example, championed a provision in 2009 requiring all employers receiving federal funds under the Troubled Asset Relief Program to meet additional conditions in order to sponsor H-1B workers. The same rules were applied to employers deemed H-1B dependent (in other words, those with H-1B workers filling at least 15 percent of full-time equivalent positions). The Obama administration also made significant changes to the H-2B program in 2015, including limiting the participation of contractors, expanding the definitions of H-2B violations, and increasing conditions on employers. The administration, however, also took steps to allow certain spouses of H-1B workers to lawfully work in the United States. The actions taken by the Trump administration to date are mostly symbolic, with the exception of retaining the current cap on H-2B visas. In the absence of Congress or the administration increasing the numbers of workers admitted in H-2B and H-1B categories, employers and workers have options to consider. Both employers and workers may consider moving to Canada, which on June 12 opened up the Global Talent Stream, a new avenue for employers to sponsor temporary, high-skilled foreign workers—with a promised application processing time of just two weeks. This new stream is not a reaction to the Trump administration, but possibly an attractive option for those who find it difficult to contend with the new U.S. policies. While it is yet to be seen whether U.S. companies and workers will move in any significant numbers to Canada, some have already relocated work to Mexico. Tech Mahindra, an Indian outsourcing company, is planning to double its operations in Mexico over the next 18 months if it becomes more difficult for Indian nationals to be admitted to the United States on H-1B visas. Of course, relocation to Mexico is not necessarily a new phenomenon: U.S. companies, including some tech companies, were already shifting operations to cut costs. Finally, the tightening U.S. labor market, coupled with employers’ growing reliance on temporary foreign workers, presents a dilemma for the President: How does his administration beef up enforcement against unauthorized immigrants and crack down on temporary foreign workers while being seen as pro-growth and pro-business at the same time? Two Federal Appeals Courts Rule Against Revised Travel Ban. The Trump administration suffered twin setbacks in its quest to implement the President’s controversial travel ban, with appellate court panels on both the East and West coasts upholding lower court injunctions blocking key aspects of the executive order. On May 25, a Fourth U.S. Circuit Court of Appeals panel upheld, on a 10-3 ruling, an injunction by a U.S. district court in Maryland that blocked implementation of aspects of a revised executive order signed on March 6 banning new visa issuances to nationals of Iran, Libya, Somalia, Sudan, Syria, and Yemen for 90 days. Little more than two weeks later, a three-judge panel of the Ninth U.S. Circuit Court of Appeals upheld an injunction issued by a district court in Hawaii that blocked implementation of the travel ban as well as the parts of the executive order that suspended refugee admissions for 120 days and capped refugee admissions for fiscal year (FY) 2017 at 50,000. The Ninth Circuit panel vacated part of the district court’s ruling, which had enjoined the federal government from conducting internal reviews of the refugee resettlement program and from seeking additional information from foreign governments for visa issuance. The circuit courts, while reaching similar conclusions, used different reasoning. The Fourth Circuit concluded that the travel ban violated the Establishment Clause of the First Amendment, and the Ninth Circuit ruled that Trump overstepped his statutory authority to make national security decisions regarding immigration. In the week between the two rulings, on June 1, the Justice Department appealed the Fourth Circuit ruling to the Supreme Court, and also asked the high court to grant an emergency stay of the two district court injunctions so that the travel ban could go into effect immediately. Following the Ninth Circuit ruling, the Justice Department asked the Supreme Court to consider that decision in the appeal as well. Four justices are required for the Supreme Court to hear an appeal and five to grant the requested emergency stay. Davis-Oliver Act Passes Out of House Judiciary Committee. The Davis-Oliver Act, which would expand immigration enforcement in the U.S. interior, was the first significant immigration legislation to pass out of committee in the current Congress. Among other measures, the bill would make unlawful presence a criminal misdemeanor instead of a civil violation, require state and local law enforcement to provide a range of information to federal authorities about suspected unauthorized immigrants they apprehend, allow local law enforcement agencies to enforce federal immigration law, and permit U.S. Immigration and Customs Enforcement (ICE) officers to carry firearms. It would also prohibit states and localities from restricting cooperation with federal immigration enforcement agencies, and would make those who do restrict cooperation—so-called sanctuary jurisdictions—ineligible for certain Justice Department and Homeland Security grants. The bill, introduced in May by Rep. Raúl Labrador (R-Idaho), has been introduced once before, in June 2015 by then-Senator Jeff Sessions (R-Alabama), but it died in committee. State Department Lifts Weekly Restrictions on Refugees Allowed to Enter the Country. The State Department in late May notified the private agencies that carry out refugee resettlement that it would be lifting quotas placing weekly limits on the number of refugees who could be admitted into the United States. The quotas had been put in place in light of the budget constraints in the temporary spending bill that funded the government through April. Those restrictions were removed by the Consolidated Appropriations Act, passed in May, which funds the government through September. Refugee advocates suggested that lifting the weekly cap could result in a near-doubling of refugee admissions, from 830 per week in May to 1,500 in June. If the weekly arrival numbers increase, refugees admissions in FY 2017 could exceed 70,000—fewer than the 84,994 admitted in FY 2016, but significantly greater than the 50,000 cap that the Trump administration has attempted to implement. FY 2018 Trump Budget Request Would Increase Immigration Enforcement. The Trump administration budget proposal for FY 2018 seeks to increase funding for the Department of Homeland Security by 7 percent over 2017 levels. This includes funding to hire 1,000 new ICE officers and 500 U.S. Customs and Border Patrol (CBP) personnel, fund more than 51,000 immigrant detention beds (including 2,500 family detention beds), and build 74 miles of border wall. The Justice Department is also seeking a $75 million increase to add 75 additional immigration judges. The Justice Department request contains a provision that would amend 8 U.S.C. 1373, the statutory provision that prohibits states and localities from limiting employee communications with federal immigration authorities about individuals’ immigration status. The revision would expand the information that jurisdictions must allow their employees to share, and bar any jurisdiction from prohibiting compliance with ICE detainers. More Texas Cities and Counties Sue over SB 4. San Antonio, El Paso County, Austin, and Travis County joined El Cenizo and Maverick County in a lawsuit against the state of Texas challenging the constitutionality of SB 4. Dallas will also join the lawsuit, and the mayor of Houston has announced that he will ask the City Council to join. SB 4, one of 33 “anti-sanctuary” bills introduced in state legislatures across the country this year, will take effect September 1. It forbids local jurisdictions and college and university campuses from enacting “sanctuary” policies limiting cooperation with ICE, prohibits restrictions on state and local law enforcement officers asking about immigration status when they detain someone, and requires law enforcement agencies to comply with ICE detainers. A U.S. district judge in San Antonio, Orlando García, on June 26 will hear the plaintiffs’ request for a preliminary injunction. García recently ruled that Bexar County violated a man’s Fourth and Fourteenth Amendment rights by holding him on an ICE detainer after criminal charges were dropped. The judge ruled that authorities would have needed to provide probable cause the individual committed a crime to make continued detention lawful. Immigration to the U.S. is the subject of significant debate, with questions ranging from the size of inflows, the role of immigrants in the labor market, and enforcement, to humanitarian admission policies and the sociodemographic characteristics of new arrivals. As such, it is important for the public to have access to accurate current and historical information. This article offers the top statistics on immigrants and immigration to the U.S.